"Everything is illuminated", "I'm not impressed by your decadence" are the stark opening words to The Politics Of Envy, the latest album from punk raconteur Mark Stewart. Once again the Maffia are absent but this time around Mark Stewart is joined by a surprising and enviable cast of heroes and musical compatriots - including Kenneth Anger, Richard Hell, Primal Scream, Lee Scratch Perry, Daddy G. Bristling with a punk energy, The Politics Of Envy in the large foregoes the dub-infused industrial electronics of the past in preference for mutant disco, post-punk, dubstep rhythms shot through with a pop sensibility for his anti-establishment polemics. It's unmistakably Mark Stewart but just not the Mark Stewart we know from the seven albums he's released since leaving The Pop Group. With spoken word from New York no musician Richard Hell alongside the scorching voice of Mark Stewart 'Vanity Kills' opens with shimmering synths, low-end electro pulse, and dub based rhythms erupting into a wall of searing industrial guitars from Keith Levene. "For I am chaos and I shall be given form" Stewart rasps, as the track sinks into a deluge of noise with Kenneth Anger, committed Thelemite and one of the most original filmmakers of American cinema, commanding theremin wails to the progressive rock noise of his Technicolor Skull compatriot Brian Butler. It's a powerful opener to The Politics Of Envy. 'Autonomia', the lead-off single from The Politics Of Envy, follows featuring a collaboration with Primal Scream with the voices of Mark Stewart and Bobby Gillespie converging on the rousing mantra like chorus of "keeping the dream alive" over riffing garage rock guitars, with an added dose of heavy duty electronics. This collaboration has unsurprisingly drawn criticism from some quarters but those in the know are well aware of Bobby Gillespie's heritage and first-rate musical knowledge and given recent Primal Scream releases - several with Sherwood at the controls - it's hardly surprising that their paths would cross. The entire track pulses with an On-U Sound XTRMTR vibe for a protest song written about Carlo Giuliani, an autonomist protestor killed in the 2001 G8 demonstrations in Genoa. Dub pioneer and all-round mad prophet Lee 'Scratch' Perry guests on 'Gang War' wildly ruminating on the "God of war" juxtaposed with the fiery presence of Mark Stewart. With deep juddering stabs and hyper dub rhythms amidst some explosive effects and, at points, with Keith Levene's PiL like guitar, the entire track recalls Perry's work with Dub Syndicate and the stark electronic noise of early Mark Stewart. It's at this point The Politics Of Envy takes something of a turn. Previous Mark Stewart releases have fused his processed industrial electronic noise with dub, hip-hop, disco and techno bottomed out by Adrian Sherwood's immaculate heavyweight production values. It's these genre crashes - to use a term favoured by Mark Stewart - that has seen him cited as an unlikely influence on everyone from Meat Beat Manifesto, Stereo MCs, Tricky, Massive Attack to Nine Inch Nails, even if a proportion of their audiences were wilfully unaware. It's something of a surprise then to find Mark Stewart following genres rather than creating them. Several tracks grapple with dubstep rhythms. You can hear it in the hyper-rhythms that propel 'Codex' alongside massive shuddering electronics. "Let me talk to the driver. He is taking me somewhere", Stewart sings - which I'm pretty sure references a working title for the album, and an unreleased track from The Pop Group. Those dubstep rhythms inform the following track too, jostling with mammoth shuddering electro stabs around the questioning, haranguing lyric of 'Want', with Mark Stewart's seering layered vocal railing against unfulfilled consumption. 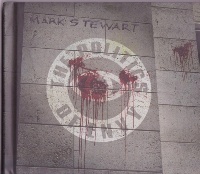 Political, personal or material it's all one to Mark Stewart. Other genres are plundered on the electro tracks 'Gustav Says' and 'Baby Bourgeois'. 'Gustav Says', itself a pop reworking of 'Rise Again' from Mark Stewart's 2004 album Edit, carries more than a trace of euro and Hi-NRG-disco music with an almost singalong "rise again" chorus sung by the Catholic Girls. Listen close and you can even hear a slap bass in there. I'm thrilled to find Penny Rimbaud of CRASS listed in the credits for this - not that I picked up on his contribution. 'Baby Bourgeois' also captures a distinct pop sensibility playing-off Mark Stewart's distorted vocal against an eighties house music sounding co-vocalist. The entire track seems to be a scathing comment on the faceless, consumerist music industry of today. It's the nearest thing on The Politics Of Envy to the Simon Mundey electronics of Control Data, but even that, if I remember correctly, avoided female soul voices. The dirge like electronics of 'Method To The Madness', meanwhile, absorbs an almost fractured version of Gary Numan's 'Cars' into its downbeat mannerisms. From As The Veneer of Democracy Starts To Fade to Control Data, Mark Stewart releases were synonymous with dystopian atmospheres. Although apparent on the downbeat electronics of 'Apocalypse Hotel' punctuated as it is with electronic throbs and judders and the heaving deep tones of Massive Attack's Daddy G juxtaposed against Stewart's piercing vocal, that feeling of dystopia is missing from much of the preceding tracks and largely absent from The Politics Of Envy. Instead The Politics Of Envy burns with a fiery post-punk presence as found on 'Stereotype' which shimmers with Keith Levene's Metal Box era guitar work over the solid bass pulse provided by The Raincoats' Gina Birch and throbbing electronics. Factory Floor's Nik Void adds co-vocals alongside an almost untreated Mark Stewart vocal. It's a prime slice of post-punk, far removed from anything Mark Stewart has produced on a solo album. It's really only on 'Autonomia' and 'Stereotype' where the elements brought by the guests aren't overshadowed by Youth's production work. It seems for the most part the role of the contributors is to add texture. And that's the problem with The Politics Of Envy: it neither feels like a solo Mark Stewart album nor a full-on collaboration. The Politics Of Envy is, as someone said to me, like Mark Stewart by committee. The Politics Of Envy is inherently backward looking. Maybe you could put that down to On/Off, a career-spanning DVD retrospective or perhaps it's a result of the revitalisation of The Pop Group. The fantastic limited-single that preceded The Politics Of Envy featured a cover of Marc Bolan's 'Children of the Revolution' (featuring Eve Libertine on the flipside). This time David Bowie's 'Letter To Hermione' from his Space Oddity album is given an unremittingly skeletal makeover with Mark Stewart's distortion free voice wrapped in sweeping strings and restrained echoed electronics from Project Dark's Kirsten Reynolds. Both of these cuts culled from the glam era exploit the gender politics of Mark Stewart's adolescence, and when combined with the punk energy and cut and paste political sloganeering that runs riot here, you could argue that The Politics Of Envy reflects the Occupy protests movements across the globe. That he's wrapped much of this in pop melodies may be a strategic move as The Politics Of Envy has resulted in reams of press words. That attention, though, is more likely attributable to the all star cast found here.